Personalise your graduation gifts for him UK Frame with the words of your choice. The Graduation Frame Date is made up of the words you choose and can include key dates, places and name. Our graduation frame measures 8inches by 8inches approx is handwritten, handmade and professionally made in the UK! It can hang from any wall, door or any other possible place you could hang a plaque from, with the natural twine which is included. We can customise the colours for you with up to 3 colours added to the design E.g. Blue, Black ,Red. If you leave the blank we will use the colours on the display frame. Please check the quality of the image. Poor images taken from the phone cannot be improved. Are you looking for some graduation gifts for him uk? 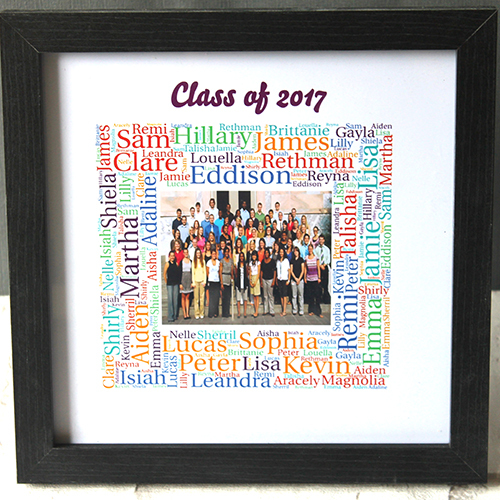 This personalised class of 2017 print makes great graduation gifts for him uk. Is someone special graduating? Make graduation a day to remember today! The frame can be personalised in colour between white or black, the print is professionally printed on 230gsm photo paper, and measures 8×8 inches in size. Have a look at our graduation product range and choose one of our unique graduations for that special someone who is celebrating there graduation. They will love being reminded that they graduated! Lovely gift for Fathers Day or any other special occasion of the year. FIRST – Choose the drop down Print Range you are wanting E.g. If you want up to 4 Prints you choose the 1-4 Prints, if you want 8 framed – you would click on the 5-9 Framed option. SECOND – You still need to select the EXACT amount of Prints/Frames that you want to buy E.g. If you want 11 Items you type in 11 – if you want 27 items you type in 27 in the quantity box. Production time – it takes 2-4 days to create this plaque for you. Standard UK Delivery – after production time it will take 2-3 days to arrive with you. 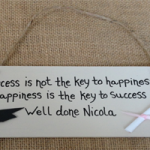 Have an idea for wedding plaques that you can’t find? Get in contact and we’ll try and help!